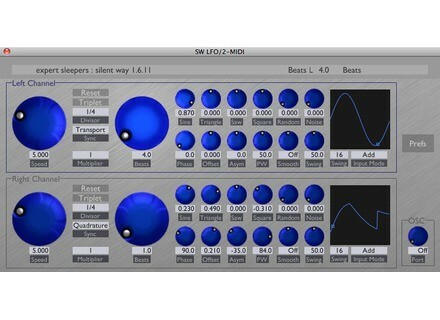 Expert Sleepers has updated Silent Way, a suite of plug-ins designed for use with analogue synthesisers, and especially as part of a modular analogue synthesiser system. The plug-ins produce no sound themselves, nor do they process sound – rather, they generate signals to be used as control voltages (CVs), which can be patched into the control inputs of oscillators, filters, VCAs etc. of an analogue system. Also, with the addition of the CV Input plug-in, it is possible to bring CVs from the synth into the computer, for recording or processing. Added a ‘Reset By Note’ option to Silent Way LFO, allowing the LFO to be reset by incoming MIDI note-on messages. 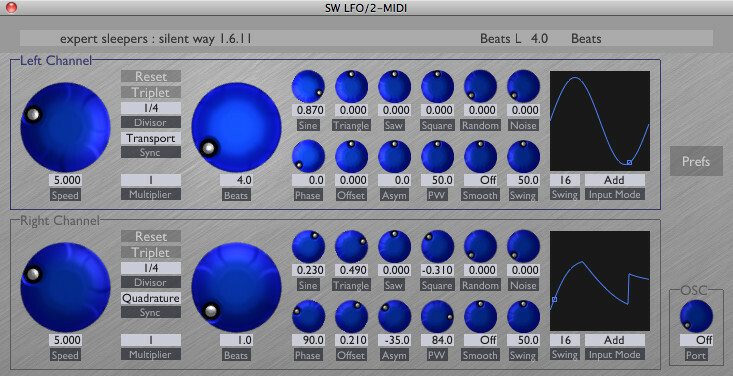 Added visual feedback of the LFO’s position in its cycle to Silent Way LFO. Added a ‘Create ES-4 Calibration’ button to Silent Way Quantizer, removing the need to load a suitable calibration file when using the Quantizer with the ES-4 module. Made a slight adjustment to the ES-4 Controller’s input processing to match that in the Silent Way Voice Controller and Silent Way Quantizer. Silent Way is available to purchase for $49 USD excl. VAT. Check out the Expert Sleepers website and the Silent Way page. Sound Magic GrandEpiano Sound Magic has released GrandEpiano, a hybrid modeling electric piano. Softube Summit Audio TLA-100A Softube has started shipping the Summit Audio TLA-100A compressor plug-in for native platforms (VST/VST3/AU/RTAS; both 32 & 64-bit). Rythmic Aura & Progressive Metal 8DIO/Troels Folmann has announced the release of Rhythmic Aura RMX for Stylus RMX and the imminent release of Progressive Metal Guitar for Kontakt.